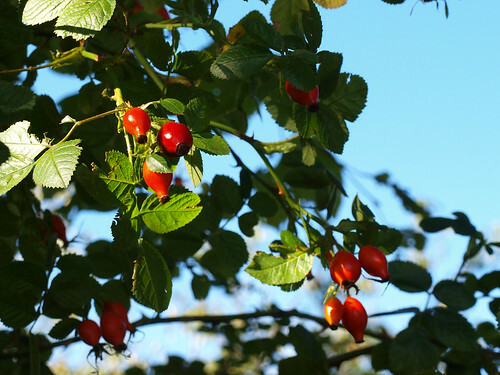 We moved into a new house at the beginning of August and, as we move further into Autumn, have been gradually learning that the fruitfulness around here is anything but mellow. 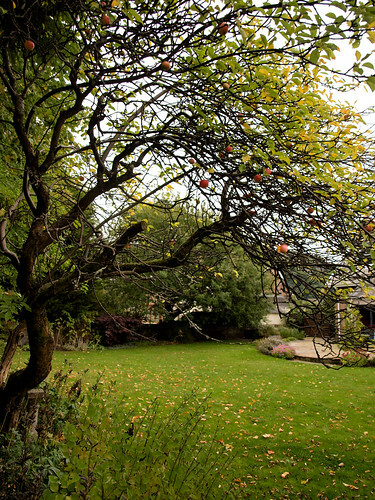 The house has a wonderful, big garden and we knew before we moved in that there were a number of fruit trees and bushes but we’ve been a little overwhelmed by just how good this year’s harvest is. I’ve spent a lot of time over the past few weeks researching ways to make the most of the bounty so if you’re interested in particular recipes, jump to the bottom of the post where I’ve included a list with links to online versions where available. 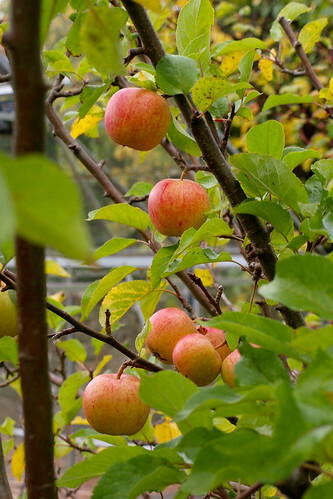 This post mainly features apple pictures but it was the plums that were the real stars. Despite giving away, literally, kilos of them, we still had enough to make two different types of jam (and several batches of each of these), two kinds of chutney, plum sauce, plum cake, plum crumble and a plum shrub similar to the strawberry shrub in my last post. 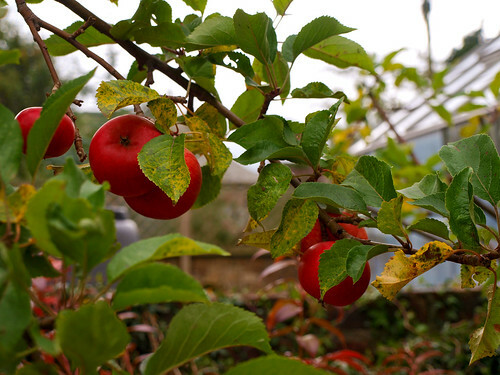 As well as the plums and apples, we’ve also been picking pears, blackberries, and gooseberries. We only got a handful of gooseberries so they got cooked down in some cider as a sauce for pork chops. 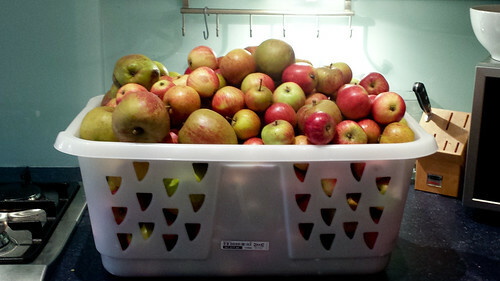 Similarly, there were only about a dozen pears so those have just been eaten as they ripened. The ½ kilo of blackberries went into a batch of apple and blackberry jam although I’ve since found a recipe for blackberry schnapps that makes me wish I hadn’t used them already. 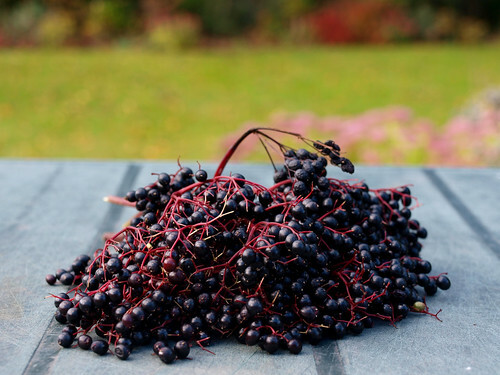 As if the list below wasn’t enough (and we really have made everything on the list below over the past month or so), I’ve also been picking our rosehips and elderberries but more on that in part II! Apple and blackberry jam – not the exact recipe I used but very similar. 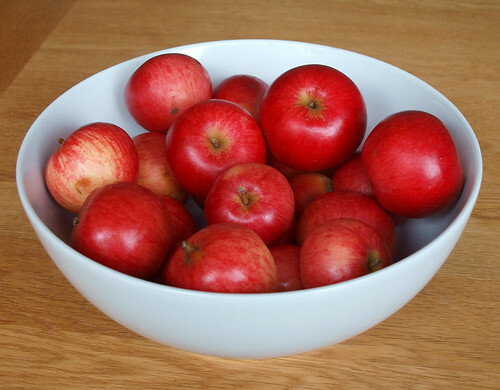 Apple pie – again, not the exact recipe but similar. Pork chops with gooseberries and cider – pretty much made up on the spot: Brown two large pork chops in a pan and then add ½l of dry cider and several handfuls of gooseberries. Cook until chops are cooked through and gooseberries are softened. Mash gooseberries into pan juices to create sauce. 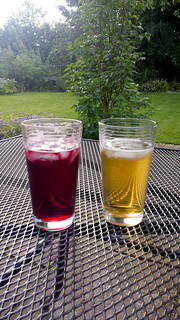 It’s been a bit hotter than usual here in Scotland over the past few months which has led to some experimenting with some new-to-me (non-alcoholic) beverages to cool down and stay refreshed. First up, cold-brewed coffee. The only way to separate me from my morning coffee would be to pry it from my cold, dead hands. However, I struggle to drink hot coffee in hot weather and while I love iced coffee I am horribly fussy about it. I don’t take milk in my coffee so don’t want it in my iced coffee either and hot-brewed, black coffee has a tendency to bitterness when it cools. 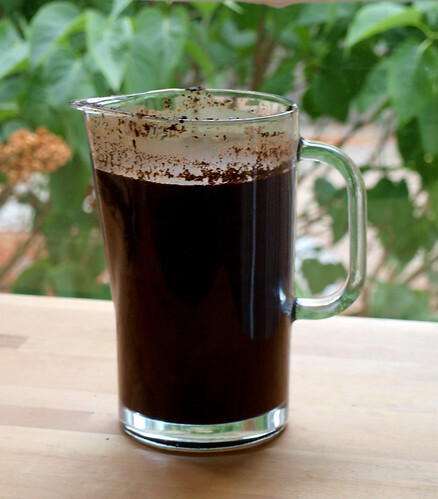 The solution: cold-brewed coffee (shown below before filtering). This takes a bit of advance preparation since coffee takes a lot longer to brew in cold water than in hot water but, that aside, is brilliantly simple. Put coffee (I use the same ground coffee that I would usually use in my cafetière) and cold water in a jug in a 1:2 ratio (I use 1.75 American measuring cups of coffee to 3.5 cups of cold water). Cover and leave to stand for 12 hours. Then filter the coffee, which I do using my usual cafetière, re-cover and refrigerate. Once it’s cold, it can be served as-is or with milk or over ice depending on your preference. 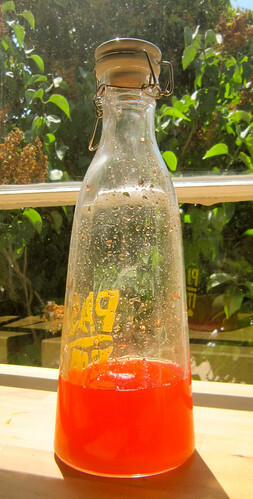 Next up, strawberry drinking vinegar, also known as strawberry shrub. 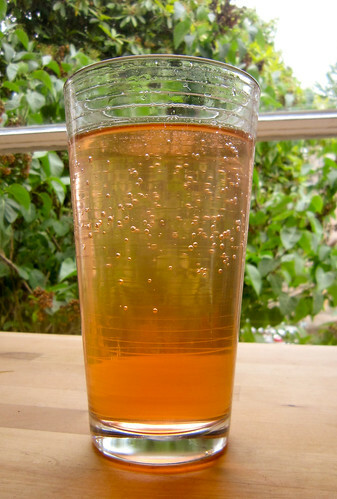 Despite the unappealing names, this is a tangy, fruity cordial-like drink which is delicious diluted. 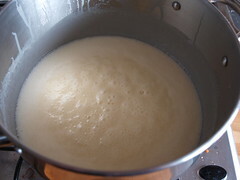 I used this recipe but didn’t wait the full week after adding the sugar, just until the sugar had fully dissolved. 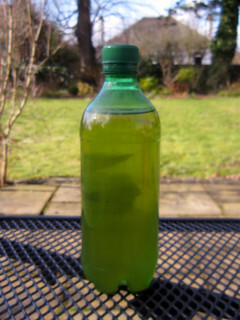 Perfect when diluted with fizzy water. Now all I need is the warm weather to come back! 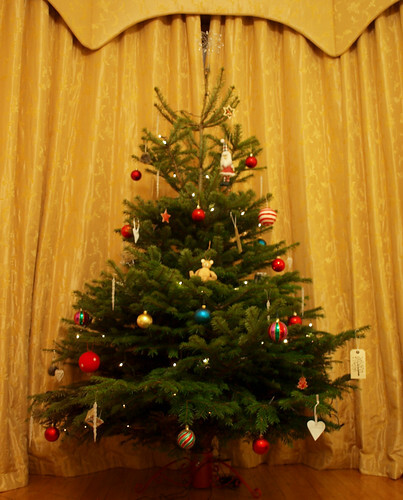 I’m sneaking in a last post of the year to share some Christmas decorating and baking photos. Looking back at last year’s Christmas post, I was complaining about November/December having slipped past in a blur of sickness and craziness at work and, unfortunately, this year has been no different. 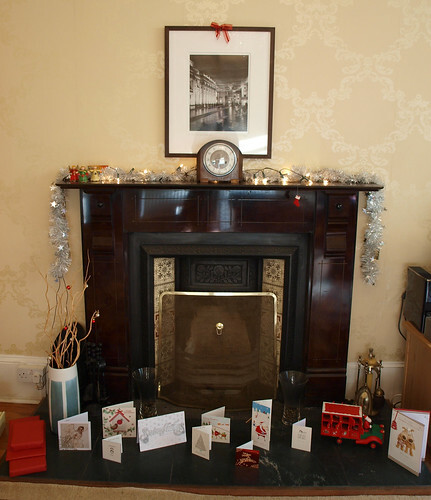 Much like last year though, we pulled it out of the hat at the last minute and the cake was decorated, mince pies were baked, and handmade Christmas cards sent. I don’t seem to have remembered to take any pictures of the cards though so I’ll need to rectify that in a future post! Turns out that I don’t have supernatural powers that allow me to bake perfect cupcakes every time but these turned out pretty well regardless. 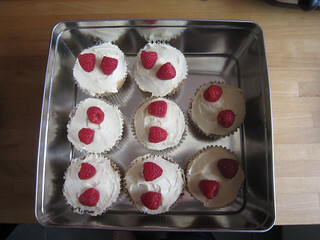 I used the Raspberry cupcake recipe from Cupcakes from The Primrose Bakery, which includes raspberry jam swirled through the batter before baking. The recipe has you add extra jam after baking and before icing by cutting a small hole in the top of the cupcakes and spooning it in but I skipped this due to limited time before we had to leave. 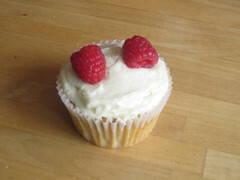 The recipe book recommends a white chocolate buttercream icing but, since I wanted as little dairy in these as possible as an alternative to the vast amounts of cream in Steven’s tart, I used the basic vanilla buttercream icing instead. 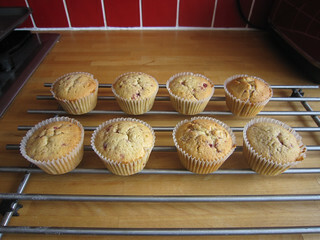 Topped with a couple of fresh raspberries, these look amazing and taste great as well. The best bit — we kept some of the cakes that weren’t quite as attractive as the ones in the photographs so we can have cupcakes again today! 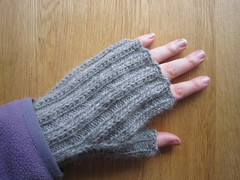 Today I finished my Christmas knitting (and, yes, that’s for presents for Christmas 2011, not Christmas 2012). I am a fairly disorganised person (my family would say “very disorganised”) and towards the end of last year, for various reasons, life just got completely away from me. So much so that I didn’t even start thinking about Christmas till about the middle of December and, as mentioned above, have just finished knitting all the presents that I decided to make. Fortunately, my family is used to this state of affairs and appreciate handmade gifts whenever they get them! 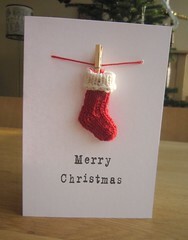 They used my mini Christmas stocking pattern, hung on some embroidery thread using a mini clothes peg with ink-stamped text. 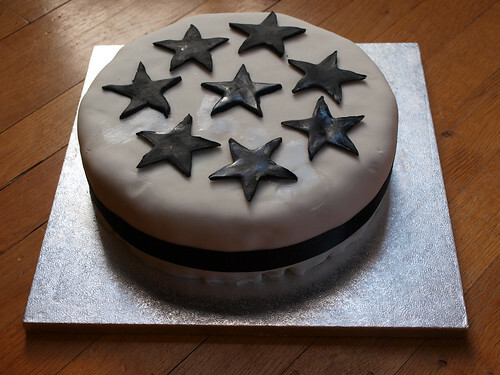 Next up on my Christmas crafting was my cake. (Ignore the cutting board, please, my disorganisation stretched to forgetting to buy an actual cake board.) 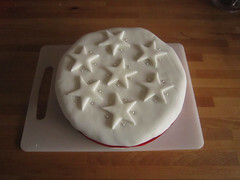 I use Nigella Lawson’s recipe from “How to be a domestic goddess” and this year went for a simple white-on-white theme with edible ball bearings. Starting on the presents, Steven and I used our new chutney-making skills and this recipe to make some home-made chutney. 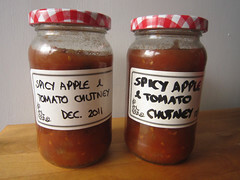 We kept a couple of jars for ourselves and I can highly recommend the recipe! 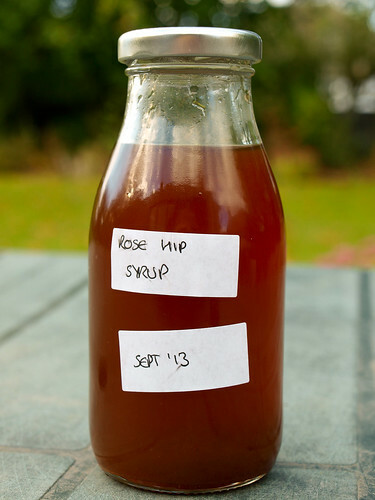 We also made a couple of jars of mulling syrup (which we failed to take pictures of) from this recipe. We didn’t keep any of this but it did look really pretty in the bottles and made a really nice gift with some wine or cider and a couple of attractive glasses. First up, a replacement Henry scarf for my Dad. I had sworn never to knit another one of these. 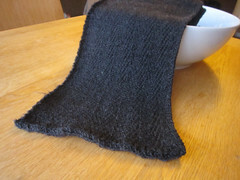 I love the finished scarf but the slip stitch pattern takes forever and for some reason I make more mistakes when knitting it than in anything else I’ve ever knitted. However, Dad loved the first one so much that when I found out he’d left it on a train, I knew I’d have to knit a replacement eventually. This is absolutely definitely the last one ever though! My Mum also got a scarf (or will when I get around to posting these) but this one was a bit of a cheat since she’s getting the sample of my Hill House Scarf. 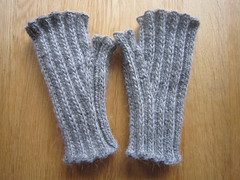 Last but not least were some fingerless mitts for my Gran. I was looking a quick, simple, elegant knit to keep her warm since she’s always cold and the “M is for …” mitts from the Fall 2011 KnitCircus were just perfect. Yarn details and other project notes for these and the Henry scarf will go up on my Ravelry projects page soon. So, now that 2011 is dealt with, bring on 2012 (or at least the 11 remaining months of it)! Tonight is Burns Night, the anniversary of the birth of Robert Burns. In fact, this year is the 250th anniversary. 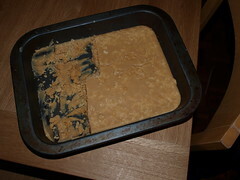 Tablet is a type of Scottish confectionery that is a bit like a grainy fudge but even more sugary. I use this recipe, which works perfectly if I follow the recipe exactly and fails miserably when I don’t. Not much of it got eaten last night but I have been nibbling away at it ever since. Fortunately, we have friends coming to stay with us for a couple of days to help us eat the rest!